"It's like in chess. First, you strategically position your pieces and when the timing is right you strike. They're using this signal to synchronize their efforts and in five hours the countdown will be over." I'm not going to bother counting how many versions of Independence Day are floating around out there, but suffice to say it's more than two, and this latest limited edition offers more of what we've already seen and heard. So what's the deal with this, and why does Fox think you need it? Well the answer is you don't really, especially if you already own an earlier version. This one gathers up the original theatrical release (02h:24m:38s) and so-called special edition (02h:33m:33s), available via seamless branching, and presents them with two previously available commentary tracks, as well as the same admittedly excellent image and audio transfers; Fox does, however, throw in a $6.50 redeemable coupon for ID4 director Roland Emmerich's Ice Age disaster flick The Day After Tomorrow. 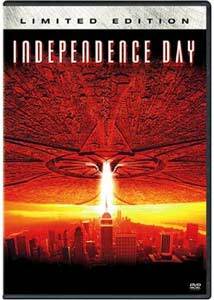 Independence Day, with its flotilla of 15-mile wide spaceships, mean aliens hell-bent on harvesting our Earth and destroying mankind, made a crapload of money when it was released in 1996. The buildup for this movie was due in part to that oh-so-memorable trailer, which really built a groundswell of anticipation amongst movie geeks. I first saw the theatrical trailer at an X-Files convention (how's that for a nerdy admission? ), and when the White House was destroyed by the massive alien ship, their was a collective gasp of silence, followed by deafening roars of approval. Could this be one of the defining alien invasion movies of our time, one that dares to defile national landmarks like the White House? It sure looked that way, but when the film opened, I was there for the first showing, and I walked out of the theater dejected and completely disappointed. The Hollywood marketing machine had betrayed me, when, instead of a grim end-of-the-world flick, I was given one of those safe, big-budget action flicks. It wasn't until I watched it again a year or so later (why, I don't honestly know) that I finally allowed the glossy summer blockbuster vibe of the whole thing to slosh all over me in all of its dumb movie goodness, and I was able to see it for what it really was. It was truly well-made junk, designed to be louder and more epic than just about anything that had come before it. I found myself more able to overlook things like the much ballyhooed convenient compatibility of Earthly computers to an alien mothership, and I didn't really care how Will Smith was able to land a helicopter only a few feet from his missing girlfriend (Viveca A. Fox) in the middle of alien-ravaged Los Angeles. All that mattered was by the time President Bill Pullman delivers his rah-rah inspirational speech I was suddenly buying the whole thing, and even trite screenwriting elements like a jammed nuclear weapon seemed perfectly acceptable. If you haven't seen Independence Day, crawl out from under your rock and see it. Which version you choose is up to you—the 2001 "Five Star Collection" is probably the definitive—but this latest edition wants to lure you with the promise of $6.50 off an admission to The Day After Tomorrow. In the immortal words of Monday Night Football, "you make the call". Image Transfer Review: Using the same exact transfer found on earlier incarnations of ID4, the 2.35:1 anamorphic widescreen presentation here is still one mighty fine looking DVD. The image detail on this puppy is just about flawless, with deep, well-rendered colors and rock-solid black levels. There is no hint of any significant compression issues to be found here. You can mock the plot flaws in the film all you want, but image-wise this one is excellent. Audio Transfer Review: Like the image transfer, it's the same old same old in the audio department, but that doesn't make it any less impressive. The THX-approved 5.1 Dolby Digital Surround track delivers just what a big action movie should deliver, with active rear cues and an absolutely thundering .LFE channel. The presentation really immerses you in the middle of the action, and if you have a properly calibrated surround setup you are in for a treat. Extras Review: Not much new in the way of extras that we haven't seen before on previous ID4 releases, except for a quickie Inside Look (02m:05s) about Emmerich's The Day After Tomorrow. It consists mainly of a few comments from Dennis Quaid and Jake Gyllenhaal, and a few behind-the-scenes clips. As an bonus, the limited edition includes a redeemable ticket (worth up to $6.50) for a theatrical showing of The Day After Tomorrow, so worse case scenario is that it's like getting free money if you were considering seeing it. Think fast because the ticket expires on 06/29/04. The two commentary tracks are ported over from past editions, and one features Roland Emmerich and Dean Devlin, while the other features special effects supervisors Volker Engel and Doug Smith (available only on the special edition cut of the film). I was a bit surprised, but Emmerich and Devlin don't have a lot of anything particularly interesting to say, and their commentary pales next to that of Engel and Smith, who at least have plenty of effects content to explain away. Though a bit techie at times, it is certainly the better of the two. The theatrical cut is divided into 54 chapters, and the special edition has 56. Each offers subtitle options in English or Spanish. Forget all of those truck-size plot flaws, this is popcorn-munching, alien invasion fun. This limited edition is a little redundant (seeing that it borrows liberally from previous editions) and it seems it was only released to hype Emmerich's The Day After Tomorrow. Recommended ONLY if you don't already own one of the earlier releases.